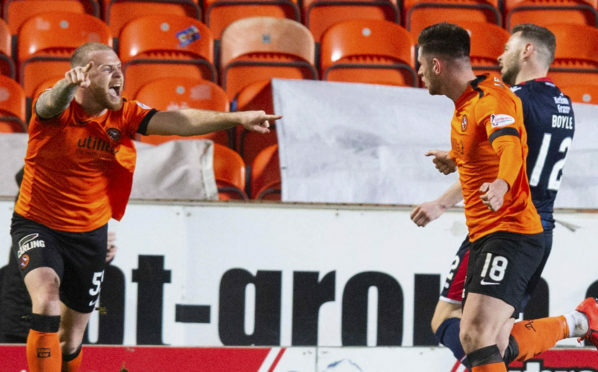 Dundee United's Mark Connolly celebrates with the goalscorer, Calum Butcher, after giving his side the lead. In the build-up to the game, the home players had put this match in the “must-win” category. With the Staggies 11 points ahead of the Tangerines, there was simply no room for error and the United players certainly rose to the challenge, securing a priceless victory thanks to a solitary Calum Butcher goal. The gap is obviously now down to eight with United having the opportunity to make up even more ground on the Highland side with games against Alloa and Dunfermline before the Staggies next play in the league. Tangerines boss Robbie Neilson made four changes from the team that was defeated at Partick Thistle 10 days ago with Callum Booth, Sam Stanton, Paul Watson and Peter Pawlett coming in for Charlie Seaman, Aidan Nesbitt, Ian Harkes and Osman Sow. The Staggies’ starting line-up included former Tangerines Michael Gardyne and Keith Watson with another, Brian Graham, on the bench. United were quick out of the traps with Paul McMullan racing down the left before cutting into the County box and hitting a low shot which was comfortably gathered by keeper Scott Fox with just 40 seconds on the clock. However, the home fans did not have long to wait for the opener in just the seventh minute. 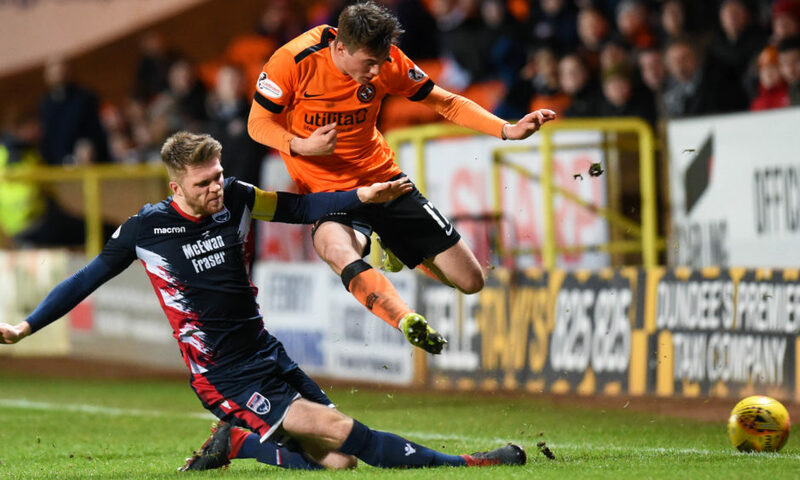 Ross County’s Marcus Fraser (L) challenges Dundee United’s Jamie Robson. Pawlett swung a corner in from the left with Butcher directing a powerful header from six yards past Fox and into the far corner of the net. It was exactly the start Neilson would have wanted with the United players certainly fired up for the game while the Staggies were looking like they were still finding their feet after the long journey south from the Highlands. Their frustration boiled over soon after when Ross Stewart was guilty of a poor challenge on Butcher directly in front of the home dug-out with referee Willie Collum showing the County player a yellow card. The Staggies finally got out of first gear but home keeper Benjamin Siegrist had yet to make a save as the 20th minute passed. United came close to manufacturing another opening when Butcher played an incisive pass into the Staggies box towards the pacy McMullan but Fox raced from his line to snuff out the danger. County finally had a half chance when Ross Draper tried his luck with a speculative long-range effort but it flew well wide. With so much at stake, tackles were flying in but United defender Mark Connolly overstepped the mark in the 29th minute when he scythed down Gardyne and it was no surprise when the referee reached for his yellow card once more. The Staggies were enjoying the majority of possession but United broke well when Nicky Clark flicked the ball on for McMullan to embark on another dangerous run into the County box but Watson came across to make a vital tackle as he was about to pull the trigger. 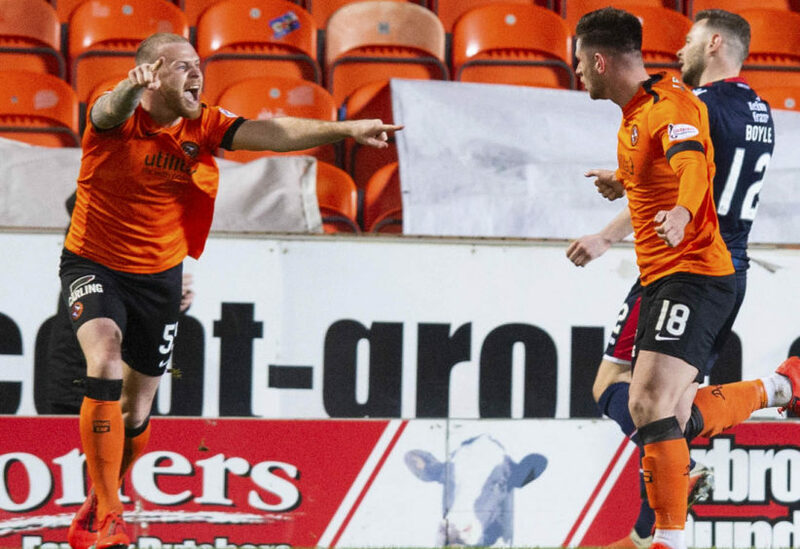 Dundee United’s Mark Connolly (L) celebrates with the goalscorer, Calum Butcher, after going 1-0 ahead. The Staggies had another half chance when Jamie Lindsay hit a shot from 20 yards but once again, it failed to trouble Siegrist. However, United saw out the half to head down the tunnel still holding on to their one-goal advantage. Just seconds after the restart, County finally tested Siegrist. Gardyne raced down the left before cutting the ball back to Stewart who looked odds on to score but the keeper stopped his low shot with his legs. United then had to make a substitution with Cammy Smith coming on for the injured Pawlett with the replacement quickly making his mark, hitting a snap shot on the turn that was saved by Fox. As the clock ticked past the hour mark, both sides were struggling to create goal-scoring opportunities with plenty of grit but little guile on show. Siegrist was finally called into action once more in the 71st minute when Kenny Van Der Weg delivered a cross from the left which the keeper had to tip over his crossbar. The goalie then came to the rescue again when he saved a low Lindsay shot with Gardyne pouncing on the rebound but Mark Reynolds blocked his follow-up strike. County were really ramping up the pressure but United were also looking dangerous on the break with Clark and Smith combining well but the opportunity was ultimately lost. And the Tangerines had a gilt-edged chance to put the game to bed in the 82nd minute when McMullan slipped a great pass into Clark who raced clean through on goal but Fox held his nerve to make a vital block from the striker’s shot. Shortly after, United hearts were in their mouths when Siegrist spilled what looked like a regulation catch at a corner but no-one in a County shirt could capitalise on the error. However, Neilson’s men held on to take all three points with the final whistle being greeted with a huge cheer from the home support. Dundee United – Siegrist, Booth, McMullan, Clark, Stanton, Robson, Butcher, Reynolds, Watson, Pawlett (Smith, 48), Connolly (Bouhenna, 57). Subs not used – Laidlaw, Fyvie, Gomis, Nesbitt, Smith, Harkes. Ross County – Fox, Fraser, Draper (Graham, 53), Gardyne, Lindsay, Boyle, Mullin, Watson, Spence (Cowie, 66), Stewart (McManus, 76), Van Der Weg. Subs not used – Munro, Kelly, Paton, Armstrong.